Hope you had a Merry Christmas and a Happy New Year! Just wanted to give you a update on Dolly! We changed her name to Halle! We attached a picture of us with her! She had her first haircut last week! Andy and I love her so much! We are having a wonderful time with her! This is Bandit. He is a tri-colored sable. His coloring is very symetrical on his face. We of course think he is adorable. The end of June I had him groomed and the lady actually shaved him down to nothing. So his coat is a little shorter than what he was earlier this Spring but we kind of like his current look. I do attempt to keep his eye area trimmed but that is the only clipping I try on my own. Keely was very helpful in showing me how to trim that area when we picked him up. I also wanted to let you know that we have 2 cats and 4 kids and Bandit gets along with everyone. His favorite is mom and he loves to sleep by me. The boys(our kids) are so impressed with how fast he runs that they want to train him in agility so we may start those classes this Fall. Good luck finding the right member! I honestly think you would be very happy with a Cavachon. On by the way, big bonus....Bandit does NOT shed, not even a little bit! As before if you have further questions, let me know. 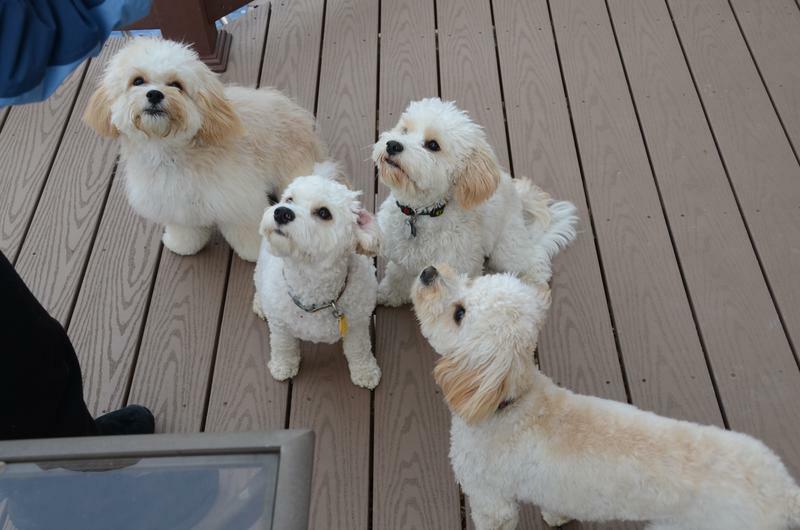 If you choose a Cavachon please forward a picture. Thank you so much for replying! We really appreciate it! do you have a photo of Bandit that you would be willing to share with us? 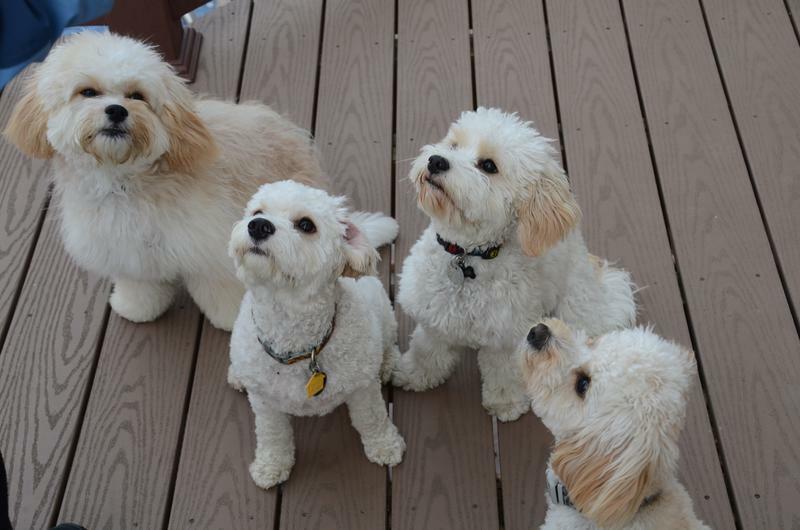 We are always looking to find older photos of the cavachons since they change so much from those cute puppy faces! We REALLY LOVE the sable mix and that is what we are hoping to find! Keely, I cannot possibly tell you how much I love this sweet little Brody of ours. I am not at all a dog lover. For my whole life we've had labs that lived outside because I am allergic to animals. 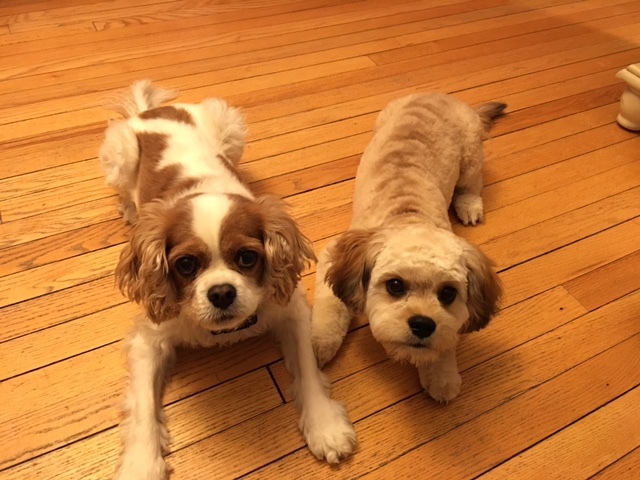 I was skeptical about getting any kind of dog, but our vet told us about cavachons and my husband and two daughters begged and begged. Six months later I am just loving having this little puppy! I never in my life thought I could love a dog, but I do!! Just a quick update about our puppy. The last two pictures of him I just took. He's up to 25lbs but the vet says he is in wonderful shape. He still lays with his back legs spread out. All five of our grandkids love him. Hi Keely – I was cleaning up old emails and saw yours, and wanted to shoot you a quick email to let you know how much we love Percy. He is a great dog and the kids and I just love our time with him!!!! I don’t have any pictures handy, but he is quite handsome too!! Still mostly white – with just a couple patches of light brown; and about 18 pounds. Anyway, I hope you are well!! And that you have had other cute dogs find great homes! girl! Everybody that she meets loves her too. Just wanted to say hi and let you know how the boys are doing. doing well and not marking in house anymore. He is so independent. all is well with you guys. We will keep in touch. I'll send some pics soon via phone. 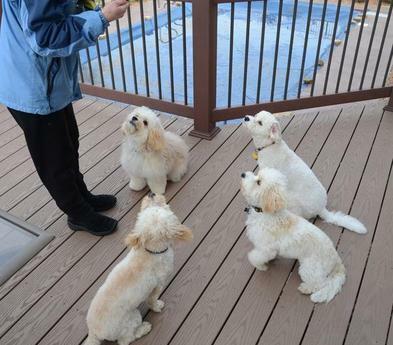 CCavachon puppies for sale , Minnesota cavachons for sale , Minnesota cavachon Breeder, Cavachon breeder, MN Cavachons, Sable cavachon puppy, apricot cavachon puppy, Hypo allergenic puppy, allergy friendly puppy. 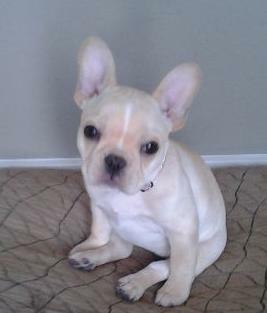 white French bulldogs puppy, black French bulldogs puppy, text. Update for you on Riley. He is doing wonderfully. LOVE him to pieces. Easy going, pleasant disposition, and completely fabulous. I wanted to know if we could get a picture of his Father? I have been curious. His name is Green Valley Jack TR27368901. got her from you in march 2011 and we have completely fallen in love with her! I hope you are doing well! Sorry it has taken me so long long to email you - but I wanted to let you know that Kensington (we call her Kensie!) is doing fabulous!! We absolutely adore her!! She is so cute and sweet and spunky - we love her so much! She adjusted so well - she cried for 20-30 minutes the first two nights and that was about it! She's doing great with her puppy training and other training and her first vet visit went fantastic as well! She loves EVERYONE - people in the elevator, people on the street, all of our family and friends, other dogs, etc. She's adjusted really well to the city as well and all of the people, traffic, noises, going to the bathroom on a tiny patch of grass does not bother her. We love her so much and can't thank you enough for breeding such wonderful dogs!! I'll send pictures soon! Hope all is well - I'll be in touch soon! Here are some pictures of Isabella just 2 days after she turned 6 months! She is such a happy - but VERY independent - little girl. There is not a puppy or person she doesn’t turn on the charm toward and generally gets petted or someone to play with! Her BFF is Gracie, a 75+ pound yellow lab, who just turned one. We have started obedience school and are doing it at Now Boarding run by the Humane Society! She is VERY social and will do anything asked of her when she feels like it! We sit with both voice and hand command, walk with a loose leash, sit for stranger greeting, take treats with only lips, look me in the eye for 5 seconds, and let her ears and feet be examined. The ladies at Curves love her and each and everyone of the early morning group come in and ask for her before anything else. She plays fetch every morning and loves to walk to look for “treasures” in the parking lot. She loves and is loved by the triplets - a good size match! And she’s just about ready to have her first real haircut. One of the Curves ladies asked if I had bleached her eyebrows. 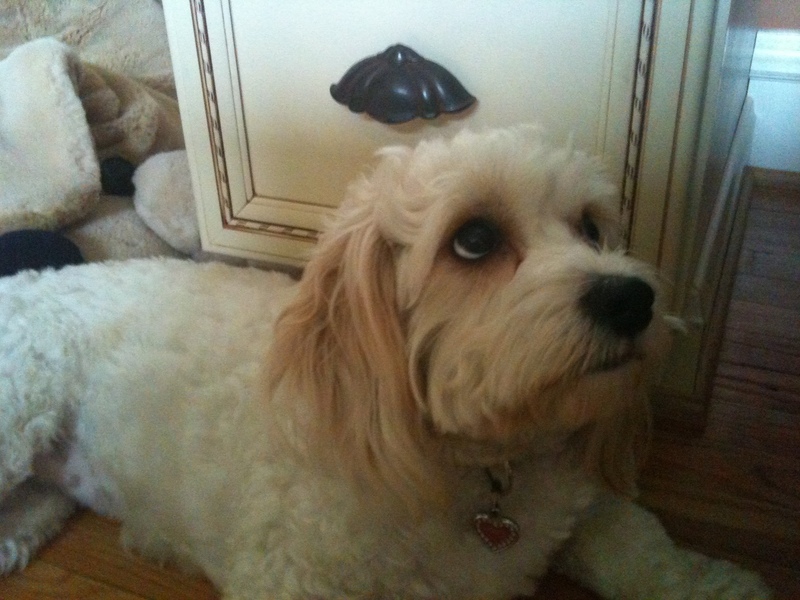 I said that I did dress her up sometimes but bleaching her eyebrows was a no-no, she was just naturally that beautiful. There are two other Cavachons close to us - not as precious as Isabella - but a pup about her age named Izzy and its big sister named Bella! I’ll try to be better about keeping you up to date with her! And I’ll work at getting more and better pictures. Just know she brings GREAT joy into my life and the lives of everyone who has met her! Thanks to YOU for everything! 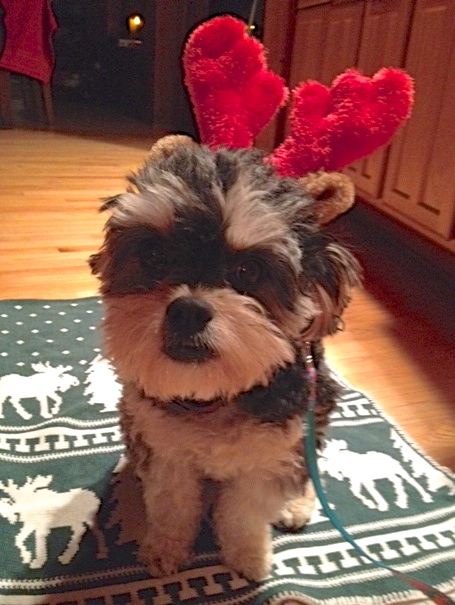 Hard to believe that it has been a year and half since I brought Lucca home with me from MN! She is so small in this photo. I remember she was only 2 pounds when I brought her home. 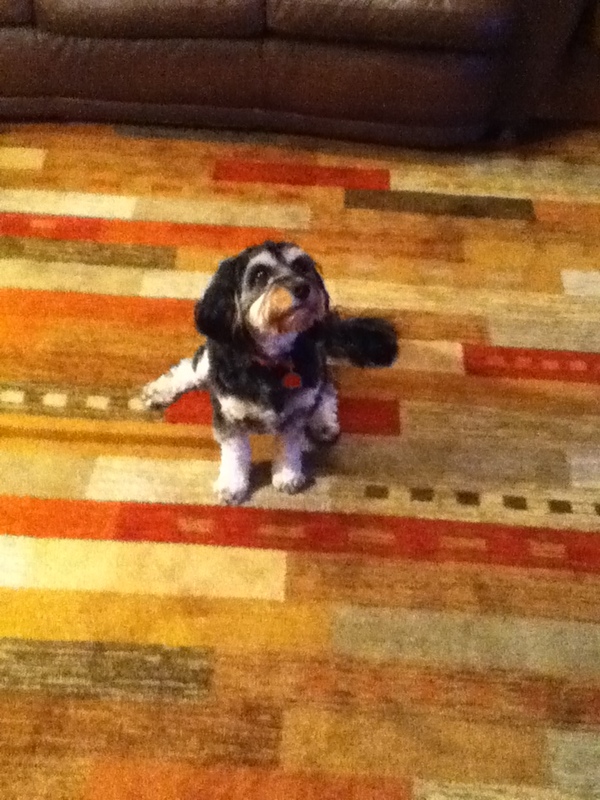 She is 10-11 pounds full grown, and has kept her apricot color, although a little lighter than when she was as a puppy. I will send you a photo of her from my iPhone later today. Lucca definitely has a will of her own, but she is kind & loving & very affectionate. My youngest nephew claims she is the cutest dog east of the Mississippi (he has not yet been west of Mississippi, so he can't comment on that area). I am really glad to have her as she has captured my heart. When I need to travel a friend of mine, Claire Thompson, stays at my home and takes care of Lucca. Claire has really grown to love Lucca and would like to get a puppy of her own. I have recommend you as the preferred Cavachon breeder. I am copying Claire on this email so that the two of you can communicate moving forward. 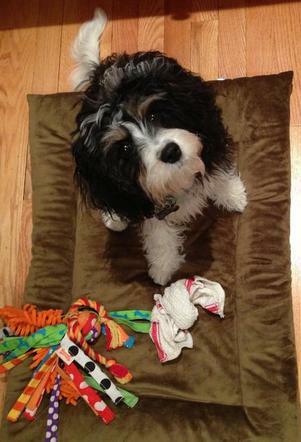 I am also considering a second Cavachon, but it would not be until the end of this early or early 2014. So, I will let you know as the time to gets closer to see if you have any puppies coming soon. Thank you again for Lucca - she is such a joy in my life! Just thought I'd give you an update on Sylvie and let you know she's doing great. She and my Boston, Bogie, have become best buds and play and race and wrestle and have the best time. She was 90% potty trained at 3 months and 100% at 4 months. All my friends and family were stunned by that. She's a smart little girl and I've started getting her ready for therapy work. She's great on a leash and loves, loves, loves people and other dogs. I couldn't be happier. She's as sweet and as cute as they come. Question: There's new research that is proclaiming the benefits of waiting to spay a female or neuter a male until they're almost a year old, allowing their hormones to help develop their joints and bone growth. I know you had said to wait until she's at least 8 months but I'm wondering if you have an opinion on waiting longer. I get frustrated with vets who all want her spayed at 6 months which I'm not planning. Hope all is well in your world and with all your fur kids. > I am always trying to remind myself to drop you a note. You did a wonderful job socializing and handling our puppy (Louis). He is so well adjusted. I never get a rise from him when we brush his teeth, clip his nails, wipe his “tears”, or clean his ears. He loves other dogs. He absolutely loves meeting new people, and my wife is thrilled that he has recently become quite the walker! I don’t have any pictures now, but he is beautiful. The envy of my entire extended family. > All is well and we feel lucky to have him. Hope you are doing well!! Fletcher turned 6 months old this weekend and I thought that would be a good time to send an update! We love Fletcher so much and he is growing up to be such a fabulous dog!! Other people are always impressed with how easy going and well behaved he is (although he shows us his mischievous side at home :) ) He is definitely a funny mix of big shot at home and slightly nervous in the real world. He is always making us laugh, loves being held, and is very very smart! In puppy school his teacher was very impressed at how quickly he was able to learn verbal commands. He loves to go for long walks and play with us, but is also content to just keep us company in the living room while playing independently (although, if he had his choice we would always be giving him attention). We were very impressed that Fletcher came home sleeping through the night in his crate, from the very first night we had him!! He had clearly had a good start and was relatively easy to potty train. Also he is so handsome, we seriously get stopped all the time by strangers who tell us how cute and/or beautiful he is. I have attached 3 pictures. One is from last week when he really needed a haircut and the other two are post haircut. outdoors and we go for many walks too. an obedience trainer to teach her a few needed manners. but may wait till she is a little older. He is potty trained, and when walking sits at each intersection and waits for me to instruct him that it is okay to cross the street. He has such a sweet temperment he has won the hearts of everyone who meets him. My grandchildre from 18 to 2 all adore him, and him them. You have a great breed of dogs, and I am thankful for him an for finding you. I see you are expecting puppies this month. Are they here? Are any available? 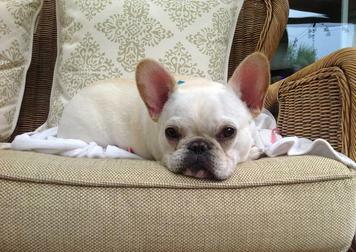 We are thinking Gracie might love a "sibling". She loves other dogs so much! the story on this little guy? 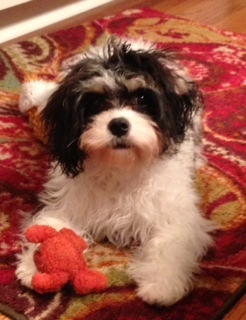 SMART, loving, playful, protective - just a gift to us all. cute pic of Oscar. He's doing very well and we think he's fabulous. 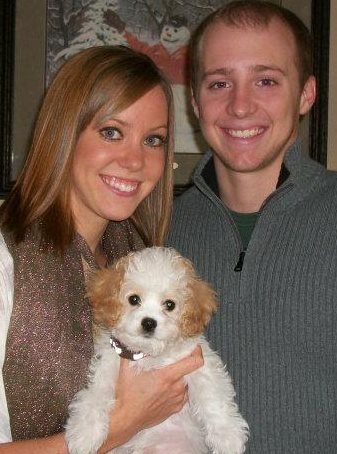 We added cavachon Liesel/Paislee to our family...she is the love of our life! 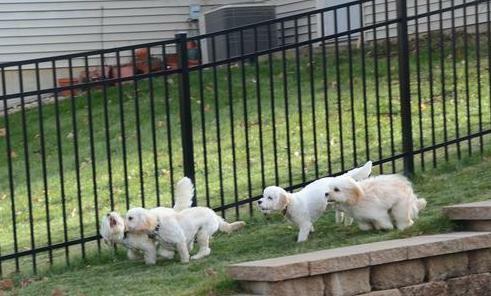 As you know, there are 4 of your cavachons in our neighborhood in Inver Grove Heights. We thought it would be fun to get them together for a photo shoot and send you some pictures. It was difficult to get them to sit still as they all wanted to play with each other. In spite of that, we did get some cute ones to share with you. On behalf of myself (Louie and Eddie), Tangen (Oliver) and Biebel (Lambeau) we all thank you for our puppies! They bring so much joy to our lives. It's no surprise that people constantly ask "What kind of dogs are those and where did you get them?" It's been a while since I have written and Molly (aka Trinket) has celebrated her first birthday (July 19th), has graduated from her first training session and just now graduated from "Puppy Star" class. We just adore Molly and her great personality. She is also so smart and has constantly been a surprise to our trainer. We enjoy checking out your site and seeing all the new puppies. They all look so sweet. Merry Christmas and thank you again for our Molly. I have only had my dog for five days, but in these five days he has grown on us so much and we couldn't be happier with him. After having a very bad experience and almost buying from a puppy mill with sickly dogs we were hesitant on buying online until we came across your website. Your website is very professional and appealing, then when I talked to you I knew right away I was buying from you Keely. I like how you post the puppies parents and tons of infomation on your website and when I received little Cracker (now named Enzo!) I really appreciated the the personalized folder with all his papers and AKC information. I also appreciate that you have someone fly down with the puppies so they are safe and not alone. 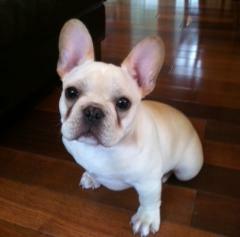 When I got Enzo he was so healthy and happy and a perfect example of a quality AKC frenchie. He was so comfortable his first night home and acted like he was here for a while! He came very well socialized and was a happy and healthy pup to begin with. I am very pleased to have done business with you and I will 100% recommend you to any potential frenchie owners if you need any references. Thanks again Keely! dearly and thank you for the careful breeding that made her possible. We just celebrated our one year anniversary with Maggie (born on Nov 6, 2013 as Honor) and I thought I would send you an updated picture. She is healthy, spunky and wonderful. She has been such a great addition to our family. Thanks again and if you ever need a reference, let us know! Baxter is doing great, he picked up on the house training very fast and no accidents in a very long time. We did puppy 1&2, and are now doing basic obedience. He's doing do at this as long as the treat bag is full! His coat gets lighter with each trim, it's fun watching his coat change. He's a handsome boy. He and Bentley play well together, Bent's the alpha and Bax concedes nicely. They have bonded better than I could have imagine. Thanks for the wonderful pup.